After wild card weekend, it always strikes me — only seven more meaningful football games this year. In an attempt not to get too maudlin, here are five things that stuck out to me in regard to the officiating this past Wild Card weekend. 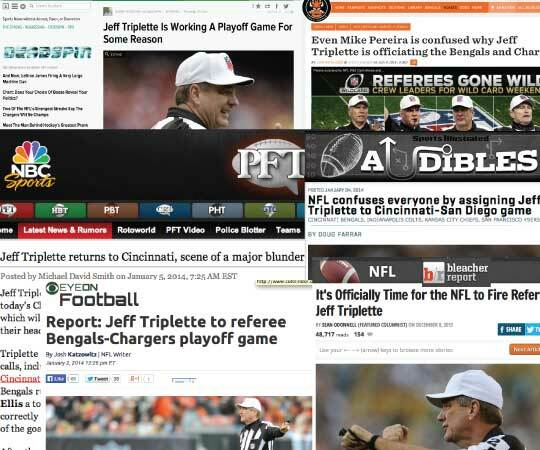 Triplette, rightly or wrongly, sent the tongues wagging when the NFL announced that he was going to officiate the Bengals-Chargers playoff game. Triplette was part of a replay controversy in a Bengals game this season, plus he crew figured in a few other confusing moments on the field. Triplette had plenty of chances to go under the hood this weekend (his game had the most replay challenges) and he nailed all of them. Not only did he get the replay challenges correct, he did a great job explaining his rulings to the stadium and the TV audience. His entire crew worked well together (I especially felt head linesman John McGrath and line judge Jeff Bergman called a great game), and the entire crew can be proud of their efforts. While there was a lot of press coverage leading up to the game, in typical fashion, there was very little counterbalance after the game; Triplette and his crew will take the media silence after the game as an endorsement of their work. Goodbye, Vaseline face. Hello, hoodie and mask. The NFL has taken another step forward in protecting the faces of NFL officials from frostbite. It used to be that the officials could wear a headband to protect the ears and rub petroleum jelly or cocoa butter on their faces to protect from frostbite. But now, the NFL gives their officials a mask that covers everything except their eyes. (Pictured here is Ed Hochuli; you’re going to have to trust me on that.) There’s even a slit in the mask for the whistle to fit in their mouth. Thirty years ago, the officials were mostly on their own to protect themselves from the cold; now the NFL partners with officials to keep them safe and as warm as possible. In a season that saw very strict enforcement of pass interference, illegal contact and defensive holding in the secondary, Hochuli’s crew “let them play” this weekend. And, do you know what? The teams adjusted. Once they were assured that the crew would call it consistently, they buckled down and played football. Maybe it was too cold and took too much energy to go into traditional histrionics! Who is Buddy Horton? He’s the field judge to was in perfect position to calmly wave off the Kansas City Chiefs’ desperate fourth down pass play, ruling Dwayne Bowe was out-of-bounds. Horton was did a great job getting into place to make the ruling. Runner-up call to head linesman Steve Stelljes calling the Husain Abdullah interception. (video). In both Saturday games (Chiefs-Colts and Eagles-Saints) the officials get together and properly ruled intentional grounding. On each call, a wing official came in to give information to Walt Anderson and Bill Vinovich respectively, and then the referee made the call. Many times the referee is watching the quarterback to make sure there is no roughing the passer and he can’t see if the pass makes it to the line of scrimmage or if there is a receiver in the vicinity. Intentional grounding is a crew call and both crews got it right. Congratulations to the wild card crews on well-called games and good luck to the divisional round crews this week.